Thanks to cutting down on spending for the last few months and having a birthday in early May, I've been able to afford to treat myself a little over the last three weeks or so, and as I absolutely love reading other people's hauls, I thought I'd do my own. The first item is one I am so happy I found. 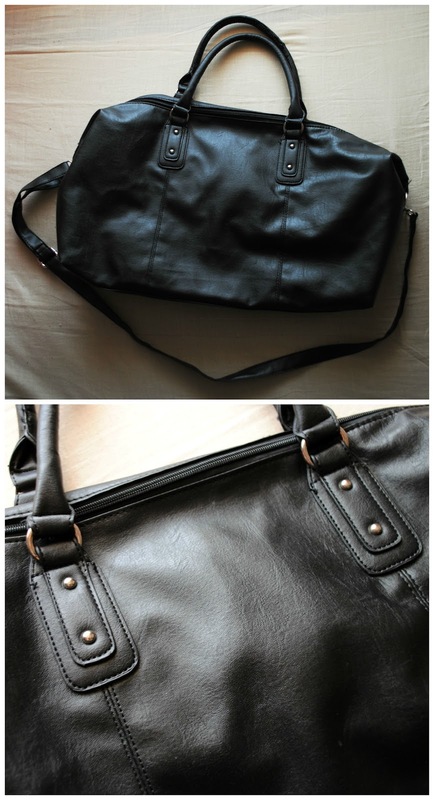 I'd been looking for a large, slouchy bag for a while, but I'd yet to find one I adored that was also affordable. As a college student who also travels up and down the UK quite a lot, I need a bag that is spacious and durable, and this bag is perfect. To make things even better, it cost just £10 from Primark. I'd seen a similar bag a few weeks back, but I decided not to buy it as I felt like the material would rip very quickly. However this bag feels much stronger and the material is a lot thicker, so fingers crossed it lasts well. It has plenty of room inside so I no longer have to force my college books into my bag, and it has three small pockets inside (one of which has a zip). I love that it has the small handles as well as the longer, adjustable one, as you can carry it on your arm when your shoulder gets tired. 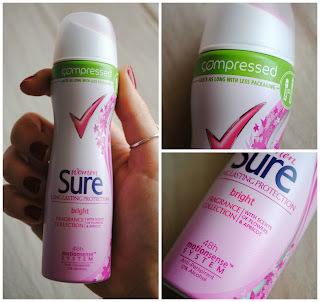 The second item is the new Sure Compressed deodorant, which I was persuaded to buy after watching one of Barbara's (ThePersianBabe on Youtube, view her channel here) haul videos, in which she mentioned this product and said how lovely it smells, and how the scent lasts all day. Fortunately when I went into Boots to buy one, they were on offer for two for £3 as opposed to the regular price of one for £2.10. I opted for the 'Bright' scent which is the one Barbara talked about, and it really does smell lovely. The can says it smells of flowers and apricots, and I think it lives up to its description; the smell is quite floral and fruity but delicately so, and as someone who doesn't normally like floral scents, I really like this one. I did feel a bit silly when I got home and realised that I had just spent £3 on two very small deodorants, so I had to keep reminding myself that it's supposed to be equal to a bigger can and will hopefully last as long. As I only bought it two days ago and I haven't been out since (lazy weekends are the way forward), I haven't given it much of a trial run yet, so I can't comment on how well it lasts throughout the day and how good it is as an antiperspirant, but no doubt I'll do a full review after a month or so. 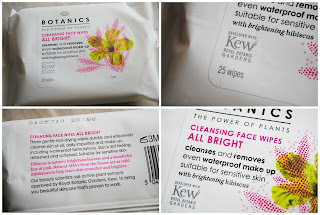 The third item is the Boots Botanics 'All Bright' cleansing face wipes. Like the deodorant, these were also on offer, only these were on 3 or 2, so I snapped up 3 packs. 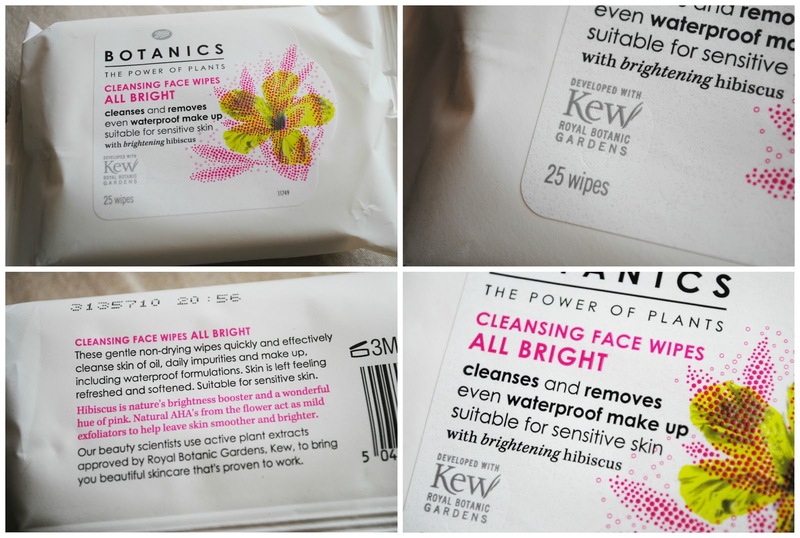 This was a bit of a risk as I had never tried them before, but I had used Botanics moisturisers in the past and loved them, so I felt I was in safe hands. Boots have recently re-vamped the packaging for their Botanics range and I'm not quite sure about it. I think the new packaging looks fresher and makes the range more appealing to a younger market, but I feel like the old packaging was more organic, which tied in better with the natural theme of the range. Nevertheless, the products themselves are wonderful, and I would definitely recommend them. I had a couple of the moisturisers a few years ago and they were so lovely. I think I had the anti-aging night cream (it was my mum's, but she found a brand she liked more, so she gave me the Botanics one and I figured I might as well use it. I know I'm far too young to be worrying about anti-aging products!) and the hydrating day cream. I don't know if they still sell these or if the formula is different, but if they're still available I would recommend anyone who wants baby-soft skin to try them. The face wipes are good. They remove makeup easily and they are quite soft, so they tick all the boxes a good face wipe should. Whether they're brightening my skin or not I don't know, but I guess we'll see after I've been using them for a few months. 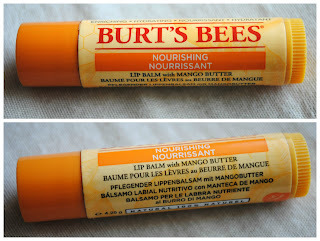 The fourth product is something I had been waiting to try for quite a while: Burt's Bees lip balm. I've only ever seen good reviews of Burt's Bees products and their lip balms seem like one of those cult beauty products that people swear by, so I figured I would treat myself to one. I'd been using Vaseline for years and had never really ventured outside of it, despite the fact I was never overly keen on its texture. 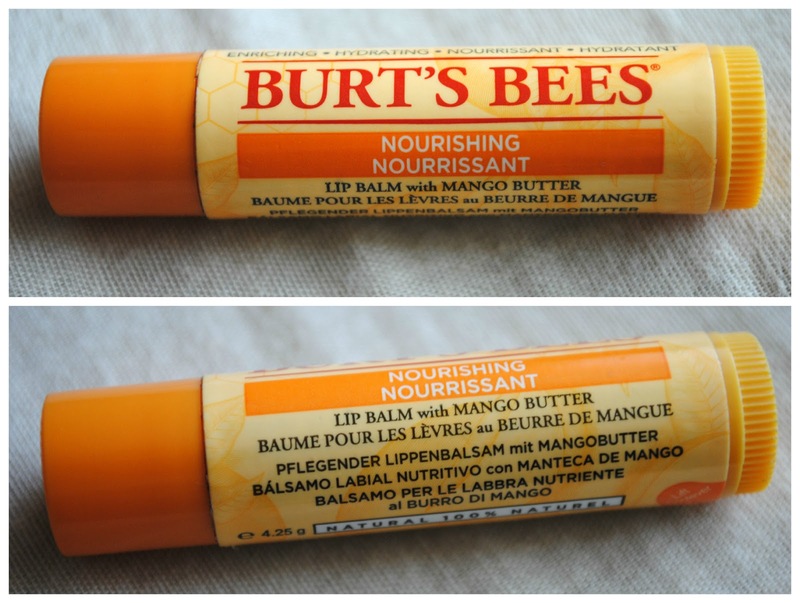 After agonising over which Burt's Bees lip balm to choose, I went with the mango butter version as mangoes are one of my favourite fruits. First off, it smells great. It genuinely smells like mango, and it isn't synthetic or sickly. The balm itself isn't sticky or slimy, and it glides on easily. Straight away I feel like it's nourishing and protecting my lips, and within a few days of starting to use it, my lips were anything but chapped. I don't know whether this is down to the balm, but since I started using it I feel like my lips have gotten fuller, although the product doesn't claim to have this effect (Either way, I'm not complaining). 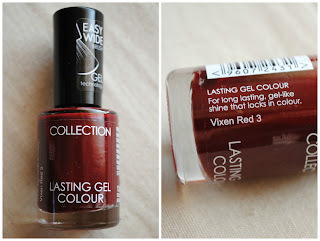 The fifth item is Collection 2000's Lasting Gel Colour nail polish in 'Vixen Red'. I'd been lusting after an oxblood nail polish for a while, and when I went into Superdrug to finally purchase one, I was torn between this and Rimmel's 'Celebrity Bash'. In the end I opted for Collection 2000 as I have used many of their nail polishes before and they're usually pretty good. I really like this colour and although it takes 2 or 3 coats, it's so worth it. I apply Sally Hansen's Insta-Dry anti-chip topcoat after each coat of Vixen Red to speed up the drying process and prevent chipping, and it usually lasts around a week before I feel the need to re-apply. The colour is absolutely gorgeous, and it's a steal at just £3.19 for quite a large bottle. Next up is this stunning ring from H&M. I bought one towards the middle of May but it was too small, so I had to take it back and swap it for the next size up. This was slightly too large, so I just trimmed down a few plasters and put them on the inside until it fit perfectly. 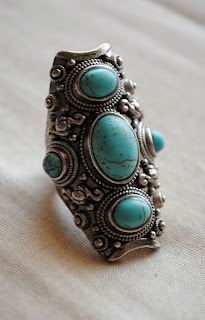 I'm a sucker for interesting and chunky silver rings, and this one fits the bill. The band is narrow at the back so it is comfortable to wear, and it doesn't get in the way when I'm writing either. I love the almost antique-y feel of it and the turquoise 'stones' are such a beautiful colour. It's safe to say this will be making many appearances and no doubt I will wear it to death. The next few items are pretty simple, but they'll keep me going throughout the summer. 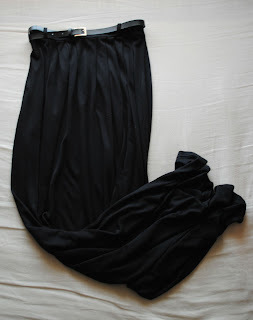 First off is this pleated maxi skirt, which I bought from Primark for £10. I had been wanting to buy a maxi skirt for a few weeks but all the ones I had tried before this hung awkwardly and accentuated all the wrong areas. This skirt however sits at the perfect place on my waits and flows out beautifully, skimming my hips and cinching in my waist. The belt and the pleats give it a sort of vintage feel, and the hem sits just above the ground rather than on it, so hopefully there won't be any incidents of tripping up and landing face first on the floor. 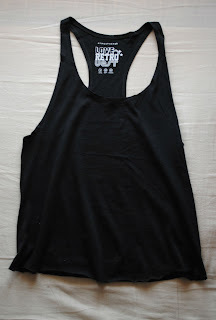 I then bought this simple racerback tank top, which I would probably wear tucked into the maxi skirt as well as with a pair of shorts or light denim jeans. I'd bought a grey version of this top about a month ago and I love the fit of it, so I stocked up and bought the black too. The top is actually really long and you could probably get away with wearing it as a dress at the beach or by the pool, but I wanted it as a top. As it only cost £2.50 (good ol' Primark), I didn't hesitate to get the scissors out and trim the hem a bit, so it now sits across my hips. 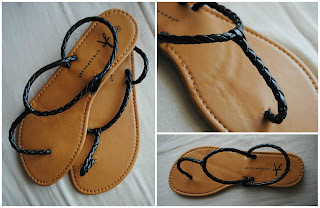 The final item in this haul is this pair of sandals, again from Primark. After picking up the maxi skirt, I realised that none of my shoes would look good with it (I virtually live in my white low-top Converses) so I grabbed a cheap (£2.50) pair of sandals that I could just slip on. I'm not expecting the sandals to last me very long, but they'll do the job for the summer. If you've read all the way through this then thank you! I only have one exam left now so I should be able to start posting more regularly now.